13.9" x 17.9" stitched on 14 count. 10.8" x 13.9" stitched on 18 count. 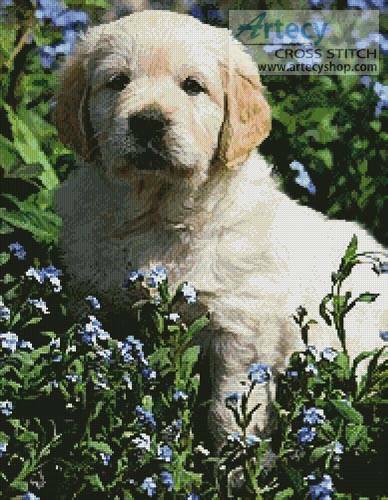 Golden Retriever Forget-me-not cross stitch pattern... This counted cross stitch pattern of a Golden Retriever surrounded by Forgot me not flowers was created from a photograph copyright of Luke Gerken/Image Broker - Corbis. Only full cross stitches are used.